Make sure your next cocktail party goes off without a hitch with Avanti’s collection of Wine Charms. Presented as sets of six, these small metal charms come in an array of vibrant tones that help your guests distinguish one glass from another. 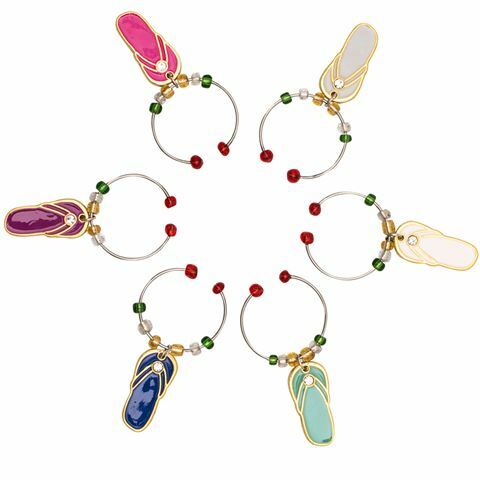 From handbags and shoes to more festive-themed designs, these charms hook around the stem of champagne flutes and wine glasses and can be reused time and time again! Includes six handbag charms in various styles and colours. Helps guests to identify their glass. Each charm is threaded through thin wire along with colourful beads. The slightly-bendable thin wire lets you attach your charms to the stems of champagne flutes and wine glasses with ease. Presented as a set of six charm in an Avanti box. Box Dimensions: 21.5cm (l) x 1.7cm (h) x 6.7cm (w).